While there are many stages to the Dow/DuPont story which should unfold over the next two years, the temptation is always to focus on what is next – in this case likely the EU approval of the deal. Consensus is for approval soon, but with some steep conditions mostly in the Ag space, where divestments could be significant – also possibly in packaging polymers. 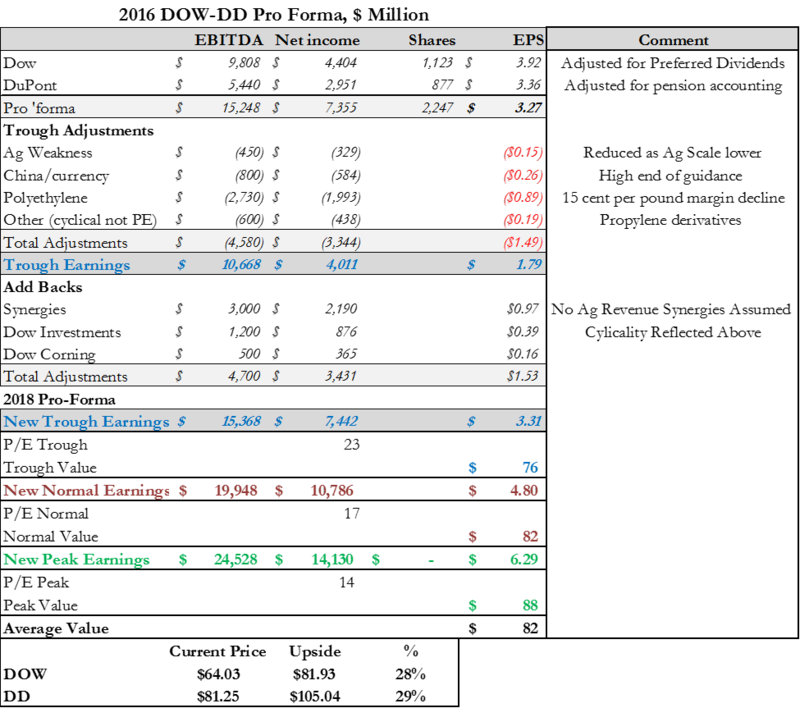 Looking through this next step, we see significant further value in the story, more from earnings momentum than from any further increase in earnings multiple. We hope the companies use the news of an EU approval to provide a comprehensive update around closing; revised synergy targets, board composition etc. We believe that synergy targets will be raised (the result of further diligence). We would like to see a Board biased towards recent appointees and possibly new blood. We also need clarity on dividend policy as the companies’ rates are different today. Earnings will drive outperformance in our view – with synergies adding to the cost work that both companies have done to date. Affirmation of higher synergies and a timetable coincident with EU approval could help offset any negative based on divestment scale. We expect positive surprises – especially at Dow – this year as polyethylene margins remain very robust and the full effect of the Sadara venture hits in 2017. We are modeling the company pre-split and can get to $6.00 of mid-cycle earnings by 2019 without any benefit from lower US corporate tax rates or from offshore cash repatriation. This drives a value per new share of more than $100 – compared to Dow’s share price of $64 today – almost 60% further upside over 2-3 years – certainly worth waiting for. This is a long game and as with all commodity biased names it will not be a straight line – news flow on ethylene could be a positive or a negative – same with crude oil – same with the shape, timing and leadership of the spins – but the value is there. Consensus opinion has some sort of conclusion to the Dow/DuPont merger over the next few weeks – with an expensive settlement likely with the European regulators and all the other regulators falling in line. What we mean by “expensive” is that we expect a significant Ag divestment – by now well telegraphed – reducing the size of the Ag business that will ultimately be spun out. At the same time this will limit the synergies available to the merged company as we believe as much as half of the originally announced $3bn of synergies were expected to come from the Ag business. We would not be surprised to see a sale of the Ag assets announced coincident with the approval, rather than a promise to sell the businesses within a defined period – we think that BASF is the obvious front-runner to pick up these assets. Separately, we might see some small divestments in packaging polymers where there is overlap between some of DD’s EVA copolymer LDPE and some of DOW’s specialty LLDPE grades – we would expect the DD assets to be sold. We would also not be surprised to see Dow/DuPont give an updated view of possible synergies at the same time they get approval – pushing goals back towards the $3bn level, or even higher, and offsetting the lost opportunities arising from the smaller Ag business. By now the companies have had more time to think through the combinations and the redundant costs that are likely. We are still missing a board composition for the combined company. We would like to see a diverse board in terms of experience, biased towards those that have been appointed by each company recently – rather than the longer-term members. This is a new company with fresh ideas and fresh opportunities and the Board does not need members longing for the “good old days”. Clarity/confirmation around Mr. Liveris’ retirement plans would also be helpful. 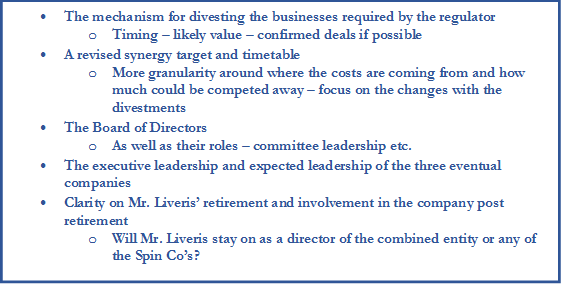 More details about executive leadership of the combined entity and the expected leadership of the separate companies post spins would be helpful now. Synergies – real size and timing. Dividend policy – the combined company needs to match the highest current yield. Both companies have produced some very good earnings since the merger was announced and have not waited to address cost initiatives that made sense with or without the merger. We have already raised our “normal earnings” and trough earnings estimates for both companies and for the combined entity based on a lower cost profile that reflects what investors have been suggesting to the companies for years. Synergies, leadership, etc. will all be important once regulatory approval is granted, but it is possible that the more significant driver of performance for the balance of 2017, regardless of when the merger closes, will be the ethylene/polyethylene market. This will remain a huge and potentially cyclical part of the business and we believe that uncertainty here is holding down values for DOW and DD, though not to the same degree that it is for LYB and WLK. Dow is a proponent of prolonged strength in polyethylene, despite the capacity additions in North America this year and the late start-up of a large complex in India this quarter. Over the past three decades, Dow has tended to be the uber-bull on polyethylene and has overestimated the market each time it has hit a slow-down. We have sparred with Dow more than once on this topic, generally taking the other side of Dow’s optimistic analysis. THIS TIME WE AGREE WITH DOW. One client who has known us for 25 years mentioned in a recent meeting that he has never seen us bullish on an ethylene cycle – he is probably right. 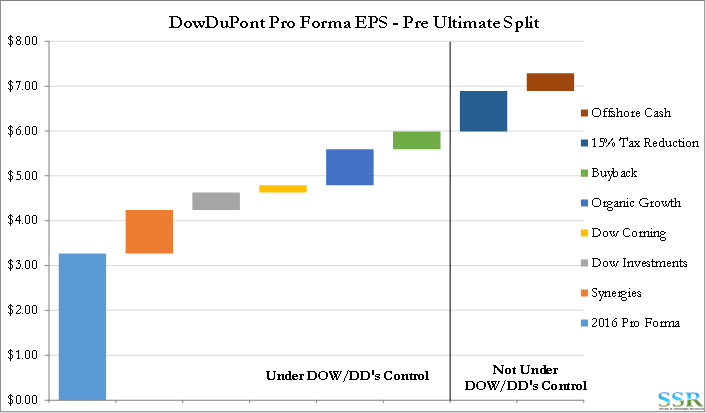 While we would own LYB and WLK for our more bullish view of ethylene – it should be another positive for Dow/DuPont and a combination of a strong ethylene market, revised synergies and popular choices with the Board and Executive leadership could be a catalyst for further outperformance from here. Combined synergies and a status quo in the polyethylene market lead us to pro-forma (pre-spin) earnings for 2018 in the range as summarized in Exhibit 2. This level of EPS, even with a discount on the trend relative multiple for both companies, suggests upside of as much as 25-30% from current levels. To get this upside over the next 6-9 months would require the investing community to move from skeptics on ethylene to at least the middle of the field. The IHS World Petrochemical Conference, which begins in Houston on March 21st, will be a platform for updated ideas and IHS itself has been moving towards a less pessimistic view on ethylene for the last few months – whether this gathering can create more confidence in the ethylene cycle is hard to guess, but we would be surprised (pleasantly) if it did. A better ethylene outlook has far greater implications for LYB and WLK but it would be a compelling reason for existing DOW and DD holders to stay the course. We do not believe that the market will react well to a simple press release from Dow and DuPont that they have an agreement from the European Regulator. We think that this is already priced into the stocks and the news in isolation, while it could result in a small gain in the share prices, could just as easily see prices fall as they did when the original merger was announced, especially if the announced divestments are larger than anticipated. We will address the ethylene question in a separate section, but given how confident Dow is with respect to the polyethylene market – some clarity/guidance around how Dow plans to move all the new Sadara product and Freeport product into the market without contributing to pricing weakness would be helpful. Simply stating that the company is sold out does not really address the issue. In short, we think that investors need a substantial update from the two companies and that they should use European Regulator approval as the excuse to give that update. 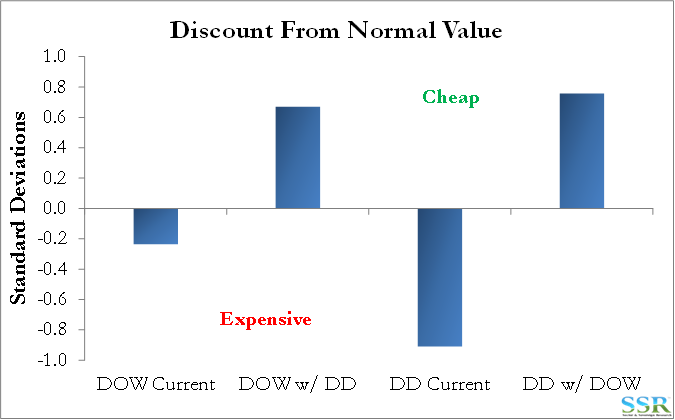 Our assumptions are summarized in Exhibit 2 – where we show ranges as well as a base case – most of the variability between best and worst case is driven by commodity assumptions. Note that in Exhibit 2 we are modeling effects that will be fully in place in 2018 and 2019 but we are not assuming any underlying organic business growth, nor are we accounting for the use of free cash. If we assume organic growth of 2% per annum and assume a 2.5x multiple for net income because of operating leverage we could add as much as $0.80 per share by 2019 – giving us normal earnings of $5.60. The combined company should have at least $10bn of surplus cash over the same period – buying back stock at $75 per share would take the share count down by 6% – raising the “normal EPS” number close to $6.00. We have made no assumptions about lower US corporate tax – illustrated in Exhibit 1. And we have made no assumptions about offshore tax repatriation – illustrated in Exhibit 1. A 17x multiple of the revised 2019 number (ex-tax changes and repatriation) would give a value of $100 per new DOW share – almost $130 per DD share. This is a stretch valuation if the combined companies deliver the synergies, use cash sensibly and the ethylene market does not change from where it is today – we believe ethylene will be stronger in 2019 than it is today. It is very easy to get carried away with the market today, and while DOW and DD have done well in absolute terms, they have barely stayed ahead of a buoyant market. The companies do not look expensive at all on a relative basis, especially adding in the synergies – Exhibit 3 – and as we have written in recent research, if we look at how the market multiple has moved since the deal was announced you could make a case for much higher target prices today than we had when the deal was first announced. However, in the commodity space, relative multiples tend to contract at market extreme highs and expand at extreme lows and absolute multiples expand in a trough and contract at a peak – Exhibit 4. In Exhibit 2 we have assumed a trough multiple of 23 with E trough/E normal of 69%. For Dow, at this ratio we have seen multiples as high as 25x, which would suggest upside, but results cluster around 17-18x which is probably the downside risk and generates a value of $56 per Dow share at the low end – Exhibit 4 shows decades of data and we would likely want to adjust upwards because of the high market multiple today and the low interest rate environment (hence our choice of 23x). Our estimate of trough earnings would not put the combined company’s dividend at risk. On the upside, we assume a peak multiple of 14x – with peak earnings 31% higher than normal – here we are right in the middle of the cluster and might be conservative. 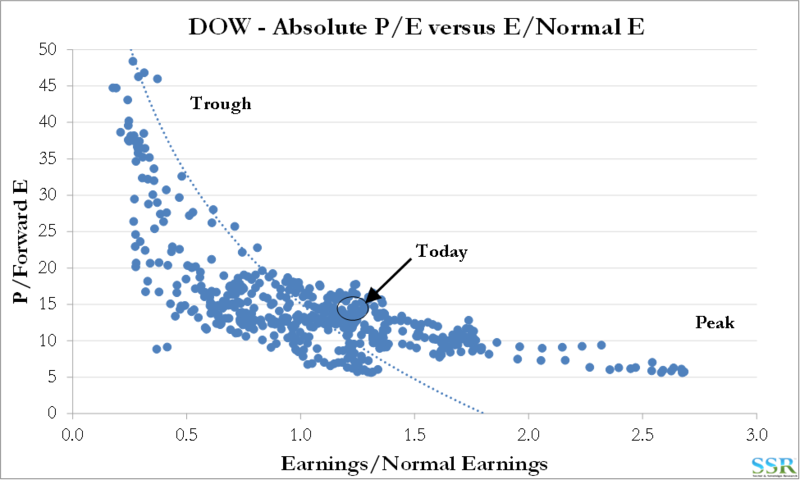 We would not expect the combined company to have the volatility of earnings shown in the chart below for Dow alone. Our premise on ethylene has not changed – we do not believe that the world is adding enough capacity over the next three years to match demand growth and that there is too much emphasis on a cluster of new facilities in the US and not enough emphasis on how they fit in the world balance. Polyethylene is approaching a 100 million metric ton market per year. At a 4% growth rate this requires a minimum of 4 million metric tons per annum of new capacity – we are not building at that rate. Ethylene is now a 150 million ton market growing slightly slower than polyethylene, but still requiring 5-6 million tons of new capacity a year. Companies have increased investments in the US because of lower feedstock costs in the US – investments have slowed outside the US because of lower feedstock costs in the US. The cost over-runs and delays, as well as lack of clarity in the US on taxes, trade etc. are resulting in delays to the next round of investments, as well as several facilities already announced. With the investment rate in other parts of the world slowing and the market looking to North America to be the next source of supply, North America is falling short and is unlikely to build enough fast enough. We believe that if Dow, Exxon and CPChem “manage” their start-ups in the US properly, we may see no change in the global market balance. We would expect each company to begin a series of planned turnarounds on other units as soon as their new units start up, such that they are not adding a step change in supply, but are managing the new capacity into the market over a period of time. This is easier for Dow and Exxon because of the size of their global platforms.